"You can't pull from the wrong location. You can't pull the wrong part"
Privately owned Robroy Industries is a world leader in the PVC-coated conduit electrical equipment market. Founded in 1905, Robroy has thrived through constant innovation. Its founders might not recognize their exceptionally clean and well organized brainchild today; the plant seems more like a well kept technical assembly operation than one utilizing high-temperature and chemical processes to PVC-coat fittings, conduit and pipe. Robroy's employees are part of the decision making process. According to the company's vision statement, all team members are expected, encouraged and enabled to grow in skill and knowledge. Not satisfied with educating only its employees, Robroy does something remarkable: it trains its customers. It created Corrosion College (www.corrosioncollege.com) to help customers and partners understand proven strategies for corrosion prevention. The accredited workshop is conducted monthly at Robroy's Gilmer, Texas headquarters. "Solve a problem and then automate"
Robroy has always recognized the role of technology in improving its operation, but does so in a results-oriented, pragmatic way. It utilizes various technologies and automation with a focus on reducing costs, enhancing customer service, and increasing efficiency while marrying that to business process and personnel practices. "By putting in an automated system, you become accurate," said Robroy President and Chief Operating Officer David Marshall. "But you just get bad information faster if bad information is what you already have. An automated system won't solve that problem. You have to solve a problem, then automate the solution." Implement cycle counting and eliminate its annual physical inventory. Robroy wanted the advantages of immediacy, accuracy, and cost savings that cycle counting provides vs. annual inventory counts. "Cycle counting was the number one issue for me," said Shipping & Receiving Manager Charley Butts. Obtain Real-time information. In the manual system, when orders were shipped, the information was entered into the system, but customer service and other departments didn't have immediate access. Ensure capacity to handle monthly business surges. 20% of Robroy's orders are shipped in the final 48 hours of any given month. Robroy needed to improve its ability to process that surge and slash the increased error rates that came with it. Improve order picking accuracy. "Accuracy was a top priority," said Butts. Robroy had to reduce its error rate and improve its ability to prevent future picking and shipping errors. Control the pace of work. Allocating how and when labor would be utilized was a key goal. In the manual system, all orders were printed and released to pickers, essentially allowing them to set the work pace based on what was in the queue. Robroy wanted precise management of the order picking process. "Preparing People's Minds for Success"
Robroy invited Dallas-based CEI Logistics, the consulting division of Cisco-Eagle, to assess its operations to determine the business case -- if any -- for a Warehouse Management System. Robroy and CEI started by mapping existing processes to identify current transactional volumes. In parallel, high level "to-be" processes were defined to leverage standard WMS functionality to reduce manual and/or redundant transactions and increase real-time operational control. The reduction in transactional volumes was converted to labor savings through analysis. The savings identified formed the basis for WMS return-on-investment. The process focused on the minutiae of the process at the front end. Then, a detailed requirement document was developed for software specification. "The right decision for us was all the preplanning," said Billie Traywick, Robroy's Vice President of Operations. "The key was covering as much as we could." The team wanted to accomplish its objectives within standard WMS functionality and avoid expensive and time consuming customizations that can derail a project. When the team defined its business objectives, it was able to overlay them with a software solution to compare software packages. The final result was a WMS system more than 90% out of the box. "CEI Logistics gave us a systematic approach," Traywick said. "We had milestones to hit and we were looking for someone who had the expertise to bring vendors to the table. We went through our objectives in detail; the time processes, activities, and that sort of thing." "We did a lot of front end thinking on this system," added Butts. "We ran through many different scenarios. What is this going to do with this? How will it affect the material handlers? They had to figure out a new way to do things." A consultative approach that "didn't compromise"
CEI Logistics' partnership-based WMS implementation process helps clients extensively document their processes and match them to the right software solution. In Robroy's case, this methodical process examined everything that might happen between the time when a truckload of raw material hit the shipping dock to when a load of processed orders were shipped out. Processes and scenarios were mapped so that all the bases were covered. "That's the sweat equity," said Marshall. "The installation is incidental. It was hard work. CEI didn't compromise its principles even though it would be the easy thing to do. They wouldn't compromise their integrity just to get an order." "The most important thing that they did outside of vendor analysis and selection was that they started to prepare our people's minds for this," Marshall added. "CEI was the right partner because they challenged us," added Traywick. "It wasn't just a yes process. They would say, "I don't think you want that because of this, etc". I think you may want to consider this. It wasn't just a matter of trading dollars for hours. We got challenged." "Writing that systems requirement document put things in a sense of order," said Marshall. The selection process led Robroy to select Minerva's AIMS package due to its robust RF capabilities, flexibility in regards to storage media, cycle counting, and process control. Robroy makes a significant investment in training and educating its employees, so it focused on training for its WMS system. "The purpose of all the pre-work," said Marshall, "was to rearrange the behaviors so that they were consistent with the software as opposed to making the software consistent with behaviors. Anyone should be able to do it with five minutes of training." "We're getting even better as the handlers become comfortable with the system," said Butts. "When you're starting on the system, you learn how to do it right. You get better and better and better. They start to understand what's happening on that gun. They're thinking ahead on the order picking gun." The day the system went live, Robroy was able to operate normally. "We knew there was success at the end of day one of going live because we shipped stuff," said Marshall. "It did not choke the organization. No customer realized we were changing the system." Robroy was able to replace its annual physical inventory with a robust cycle counting system that continues to yield benefits. In the manual system, Robroy relied on individuals to count a row or set of parts. Cycle counting enforces the need to count in real time. "We didn't know what got counted and didn't get counted," in the manual system said Butts. "Cycle counting makes sure that every single item in every single location gets counted at some time during the year." The benefits go beyond eliminating the annual inventory and its labor costs. 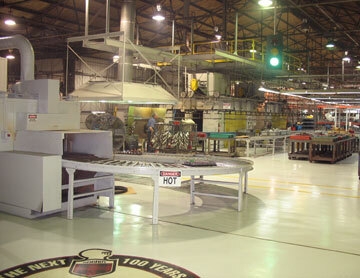 Cycle counting helps Robroy set inventory levels and reduce labor costs. "The system can tell us high movers, low movers, etc.," said Butts. "It helps us cycle count more of the higher volume items. If you have a part that's been sitting there for three years it doesn't make sense to count it every year and you count it over and over again and it never moves. You eliminate that time." "There are now inventory accuracy measurements," added Traywick. "On a daily basis we can see the accuracy with and without inventory adjustments. We can print that number anytime." "With cycle counting," said Butts, "if there is an issue we catch it much faster than a physical inventory would." Often an issue is identified within days, rather than within months. Twenty percent of Robroy's shipments occur in the last 48 hours of a month, creating a potential shipping bottleneck and causing error rates to climb during this rush to fill orders. Since WMS implementation, error rate issues have vanished. Despite a series of record quarters, the influx of late orders have been filled without additional headcount or impact to the workflow. "It doesn't stretch us," said Marshall. "Our error rates used to skyrocket in the last three days of the month. That increases transaction costs. Having the ability to ship twenty percent of your business in ten percent of the available time and maintain accuracy is significant." Since the WMS implementation, Robroy has improved customer service without increasing headcount on a higher volume of orders. 'the system automatically sends tracking information to customer service," said Butts. "They have real time access to it." The system ensures that customer service only becomes involved in exceptions. Previously, an agent would have needed to intervene in customer service situations that have either been automated or eliminated by the WMS implementation. "We know things as soon as the warehouse does," said Material/Service Manager Donna Waterstraat. "If there is ever a shipping error - a rarity these days - we find it before the customer does." "Information is visible to everyone," Marshall said. "Anybody in this building, including me, can look at a customer's order and know if it's shipped or not -- carrier and pro number. We're not managing 90% of the orders. We're managing just the exceptions." "If we stock it right, it's impossible to pick it wrong"
It is difficult to make a picking error at Robroy these days. Butts believes that if a part is stocked right, then it can be handled through the supply chain correctly, quickly, and accurately. "You can't pull from the wrong location. You can't pull the wrong part," Butts said. "WMS is more about accuracy than speed," Butts added. "You still have to pick that part, you still have to box it, you still have to put it on a truck and ship it out. You can do things faster and smarter, and those things save time, but the biggest thing it brings me is accuracy." According to Marshall, the WMS system eliminates the kind of indirect transactional costs across the operation that he needed to slash. For instance, an incorrect order incurs transactions across a number of departments and involves multiple people. A shipping clerk had to enter that order, a customer had to contact a customer service agent, the agent had to correct it, and the entire process had to be redone. This might involve accounting, warehouse, customer service, and manufacturing personnel, all doing work twice that the WMS system has - at least in part - eliminated from the process. "Lots of jobs shifted," said Butts, offering the shipping process as an example. "Processing UPS shipments used to be time consuming. You had to key in all the information. That's gone. We're now locked into the UPS stream. That saves a bunch of time on UPS orders." A dedicated parcel shipping clerk position was eliminated due to the UPS system being tightly integrated with Robroy's business system. In three record quarters since the system went live, Robroy has managed to reduce those costs as well as others. It also freed significant customer service time. "It gives me more time to do other things," said Waterstraat. Her team can focus on dealing with exceptions and providing better overall service rather than dealing with errors or finding information. Controlling the pace of work was important to Robroy. In the shipping operation, this was particularly vital. "Before the WMS we printed worksheets and put them in the window," said Butts. 'the pickers pulled as much as they could for the day. What didn't get pulled we had to cancel until the morning. The pickers could pick and choose the job they wanted to pull so we didn't have control of who was pulling what, and when." The WMS system changed that dynamic by giving Butts control of exactly what is being pulled, when, and by who -- with easy access to make changes. The system is set into zones, and the pickers pull whatever is assigned to their gun. Personnel schedules can be adjusted in advance for heavier workload days with more foresight. "I can pull people out of production to help pull conduit, pull parts, and load trucks," Butts said. "I can see what they have in front of them. I know where the load is. I know what pickers are going to pull. I can have a constant work flow without overloading people." "The trend is that we can pick more, faster, and it's going to be right."